In the early 20th century, northern New Mexico reportedly shipped out more lambs to market than any other area in the world. Much of that was from ranches around Los Ojos and Tierra Amarilla, a high country of aspens, towering pines, and pristine meadows about 90 miles west of Taos. A narrow-gauge railway, known as the Chili Line, ferried the lamb and other local agricultural products to the outside world. Changing economics and the growing American desire for beef caused the demand for lamb and the railroad to dwindle. A way of life was nearly extinguished, too. Today, Antonio and Molly Manzanares, the folks behind Shepherd’s Lamb, strive to make the meat viable for a new audience. In the process, Antonio and Molly have done much to restore the area’s heritage, and to reverse the sagging fortunes of once-prosperous Los Ojos, near the Manzanares family’s ancestral sheep ranch. The Churro, a hardy breed of sheep, was brought here by early Spanish explorers. Churros proved so suited to what is now northern New Mexico that the sheep were among the area’s first exports back to Mexico. The breed was valued for its meat as well as for its long, dense wool, which took natural dyes well and was easy to spin and weave. The sheep became extremely popular with Hispanics in the northern Río Grande Valley, and Navajos in the state’s northwest corner, both of whom used the wool for their signature tapestry-style rugs and blankets. The Churro was so well known that the Mexican pastry, the churro, even took its moniker from the sheep’s wavy wool. Despite the Churro sheep’s success on these levels, it fell out of favor because it grew more slowly and remained smaller than breeds imported later, making it less cost-effective to market. In Hispanic communities, government-encouraged cross-breeding nearly wiped out the pure-bred Churro by the 1930s. Antonio and Molly and their four children have played a major role in the resurrection and preservation of the Churro breed, and of New Mexico sheep ranching generally. They own and steward one of a small number of remaining herded bands (local parlance for flocks) in the state. In fact, they’re among only a few ranchers in the country who graze sheep on wild land, moving them among meadows and mountains seasonally. You can see that the name, Shepherd’s Lamb, truly reflects their husbandry. 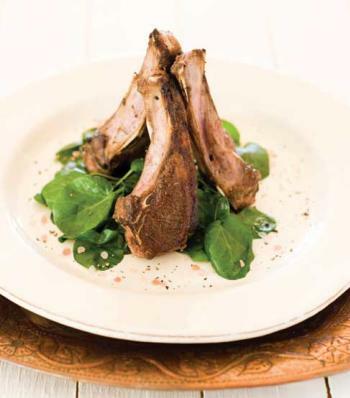 The family grasped early that lamb would remain a specialty product. Having always raised the band sustainably in the way of his grandfather, Antonio realized that receiving organic certification (New Mexico’s first for lamb) would not be much of a stretch, requiring mostly paperwork rather than modifications to their agri-cultural practices. Facing cheaper competition from halfway around the world, the Manzanares family also organically raises other breeds of sheep, to help offset the higher costs of the Churro. Part of the family’s vision of making sheep ranching economically viable again in the north is through such projects as Tierra Wools, a weaving co-op, gallery, shop, and school, on Los Ojos’s Main Street, which uses local wool in this heritage craft. Molly is among the founding master weavers. Discerning restaurants around the state, including The Love Apple in Taos, and Aqua Santa and Mu Du Noodles in Santa Fe, serve Shepherd’s Lamb. You can buy it, along with wool and lamb pelts, at growers’ markets, or directly from the Manzanares website. I initially met Antonio some dozen years ago, in a parking lot in Tesuque. He handed off to me a bundle of 120 lamb chops that were to become the centerpiece of a benefit dinner for the Santa Fe Farmers’ Market. He told me matter-of-factly about the challenges of ranching, and how he was hoping to demonstrate an economically viable model for future ranchers. Even when you work as hard and as smart as Antonio and Molly, it’s tough, but we can all be glad that they’re still striving to do just that. Either type of lamb chop works in this recipe, whether the meaty, marbled T-bone loin chop, or the rib chop, with its soaring rib bone and small but luscious morsel of meat. Rub each lamb chop well with cut side of a garlic clove. When first garlic half falls apart, use a second, and so on. Sprinkle chops with salt and pepper. Warm large, heavy skillet over high heat until very hot. Pour in enough oil to just coat bottom of skillet. Add half of lamb chops and fry 2 to 3 minutes per side for rare to medium-rare chops. Remove chops, arrange them on a platter, and tent with foil. Again add oil to coat skillet’s bottom and fry remaining chops. Add watercress to skillet, turn off heat, and cover. Residual heat from skillet will wilt greens within a couple of minutes. Stir once if needed to wilt evenly. Give greens a good splash or two of pepper vinegar and spoon around chops. Serve immediately with cruet of pepper vinegar on the side. This deep-fried Mexican confection, with its long, slightly twisted shape, was named for its resemblance to the distinctive wool of the Churro sheep. 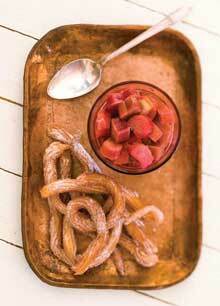 Churros are especially good with tangy, spring rhubarb on the side, but each can be served on its own. The rhubarb can be made a day ahead, if you wish, then served chilled or reheated. Preheat oven to 325 degrees Fahrenheit. Place rhubarb in shallow medium baking dish. Scatter orange zest over, if using. Stir sugar into rhubarb. Cover dish with lid or foil. Plan on total baking time of about 35 minutes. Bake 20 minutes, then remove cover. Stir once so that sugar melts evenly. Return uncovered dish to bake about 15 minutes more, or until all sugar has melted into a sauce and rhubarb is tender. Stir together 4 tablespoons sugar and 1 teaspoon coriander on dinner plate. Reserve. Combine in medium saucepan: orange zest, orange juice–water mixture, butter, cinnamon, salt, and remaining sugar and coriander. Bring to full rolling boil. Stir in flour all at once and remove immediately from heat. Stir mixture until it becomes a thick pasty dough with a satiny sheen and pulls away from sides of pan. Transfer dough to a stand mixer’s bowl. With mixer on medium speed, add eggs one at a time, beating about 30 seconds after each egg is added, and scraping down sides of mixer bowl as needed. When all eggs are incorporated, increase mixer speed to high and beat dough a full 2 minutes. Heat about 3 inches of oil in large, heavy pan or deep-fryer to 365 degrees Fahrenheit. (Oil temperature should be adjusted for altitude. At 7,000 feet, for example, the approximate altitude of Santa Fe, bring oil to only about 355 degrees.) Place baking rack nearby over several thicknesses of paper towels. While oil heats, transfer dough to pastry bag fitted with a star tip. Pipe ribbons of batter 6 to 8 inches long, into hot oil, several at a time. (Alternatively, you can spoon dough into a gallon zipper-lock plastic bag and cut off ½ inch of lower corner of bag. Dough squeezed from bag’s corner will lack the usual distinctive ribs from the star tip, but churros will taste fine.) Fry briefly, a matter of seconds, until golden-brown and crisp. Drain churros on baking rack, then roll immediately in reserved sugar mixture. Return to baking rack until all churros are fried. Serve warm, with rhubarb on side.